Fancy yourself good at doing cover songs? Well, here is your chance to fly, little birdy! In support of our new single, “Angel,” us, Roadrunner Records, Gibson, and REVOLVER Magazine have put together a contest where fans can win the prizes listed below! All you have to do is upload your cover of our new single “Angel” to YouTube and then share it on there, Facebook and/orTwitter with the hashtag ‪#‎FlyOnYourOwn‬! The band will check out the entries, pick the winners and even share some of their favorites across their own socials. Remember, don't forget the hashtag #FlyOnYourOwn. 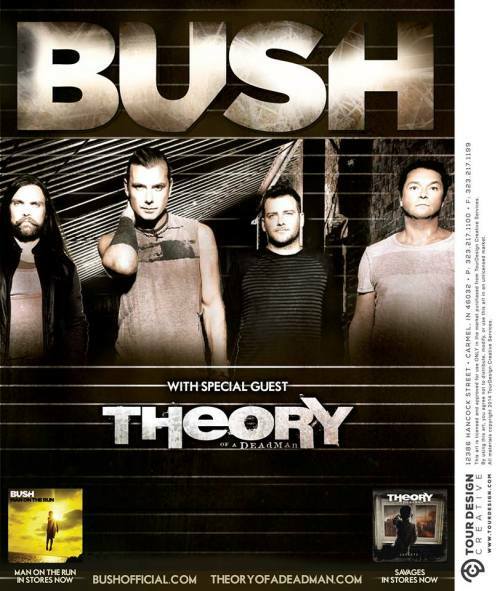 Drumroll please… we are so excited to announce that we'll be going on tour with Bush in 2015! Check out the dates below- tickets go on sale this Friday 11/21 at 10am, more to be announced very soon! In Theory of a Deadman's 'You Don't Know Me - Tyler at the State Fair Part 2," frontman Tyler Connolly visits the State Fair.. again! Read more about You Don't Know Me! We will be at NAMM 2013! Read more about We will be at NAMM 2013! "You Don't Know Me" Latest LA edition! Read more about "You Don't Know Me" Latest LA edition!